October is my happy place. Even though it snowed today. I forgive the snow because it was in October, and it didn't stick anyway. October is when I feel like doing projects, and as busy as I am, I have managed to quickly do a few home improvement things, and it makes me so happy. October is when my parents come visit! And help me with my projects! They're coming on Saturday and I can't even wait. October is when Bria, my first child, was born. And she is turning TWELVE on Saturday. I have a hard time wrapping my mind around that. TWELVE. A young woman. And such an amazing one, too. October is when you eat pumpkin food. Unless you're me. Then you just smile and be happy for your children when your amazing TWELVE-year old puts on your apron and makes more pumpkin bars or pumpkin cupcakes. And then you leave the kitchen when they eat them. Because, after all pumpkin IS your favorite food. You even have a Pinterest board about it and continue to pin things on it even though YOU CAN'T EAT THEM! 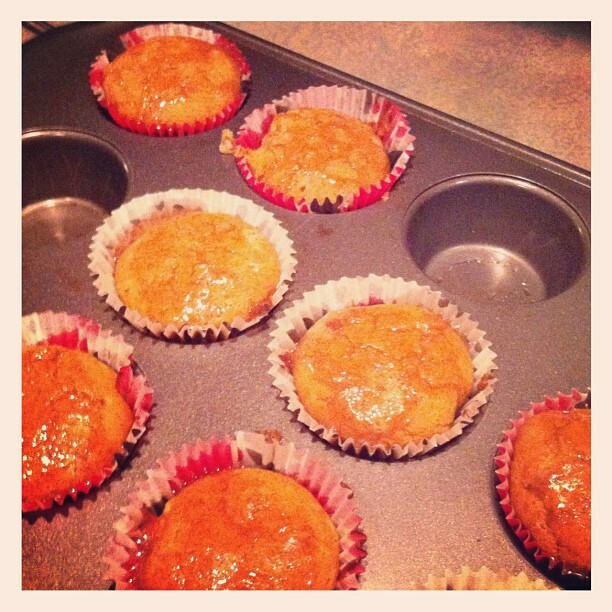 These are some gluten-free, dairy-free pumpkin cupcakes that Bria made last week. I did eat these, it was before my radical diet change, which I have yet to explain on this blog because I never blog anymore. They were yummy. October is when there is candy corn. Today I bought five bags. Don't worry, I didn't eat them, though it takes all the willpower I have not to because I LOVE candy corn. It is definitely my favorite. I totally fell off the crazy diet wagon last week because of it. But I was in quite a bit of physical pain over it, so it was a little easier to just eat one today. One measly piece of candy corn, and I still paid for it with pain. But I'm still happy because I like to look at it and I have four jars of candy corn to share with my friends. If my kids don't eat it all, anyway. October is also apparently when Cadbury Screme Eggs come out. Never heard of them? Well, they are just like Cadbury Creme Eggs, if you didn't guess that already. Only they are purple and green. Seriously, Cadbury? How is this fair? I can't stay away from these things at Easter and now you are asking me to exercise my willpower at Halloween? WHEN THERE ARE ALREADY CANDY CORNS? October is Halloween. One of the funnest (I know that's not really a word) holidays of the year. Except that I am not on the ball with costumes for the kids this year. Nobody even knows what they want to be! Except Chloe. She's going to be John Lennon. October is when the world turns all of my favorite colors. If you ever come to my house, you will see that I have painted it all autumnal shades: golds, reds, oranges, browns and yellows. With the exception of the girls' rooms, I have a cozy fall feeling all the time in my own house. Lucky me. Yep. 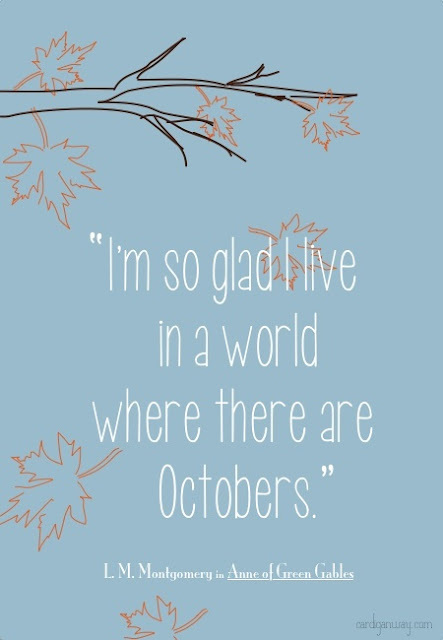 October is my happy place. 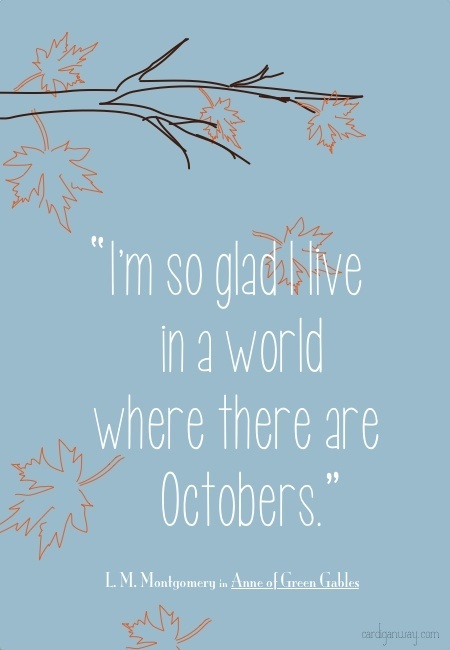 And I am so glad I live in a world where there are Octobers. September and October are payments in advance for the six months of snow and ice that are to come! I was just thinking today how fun October is. James is just getting a kick out of the bin of pumpkins at the grocery store. Everytime we go, he wants to get another one. I caved and bought him just two small pie pumpkins. As for the candy corn = heavnely. I love it. We're using it as our potty training candy. Funny thing though, back in Aug when it appeared in the store it was only a dollar a bag. Now it's almost 3...hmmmm price gougers! As for your new diet ---- um, yes what is this? No pumpkin? It's a squash for petes sake? Are you allergic to that too? I'm intrigued. October is hands down my favorite month of the year. Like, exponentially so. Fall is here for real (not like in September, when it can try to be summer every once in a while) but the stresses of the holidays don't come for another month. And I had my LAST baby in October, when I could just love him and hold him without all that new parent angst, knowing that he was the forever baby. To me, THIS is the most wonderful time of the year.